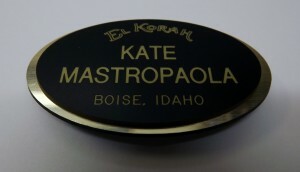 J&J Creations creates name badges, engraving on plastic stock in a variety of colors. When the names and titles are engraved, the background color shows through. Please contact us for your possible color selection. The badges can be cut to any height, width, or shape. 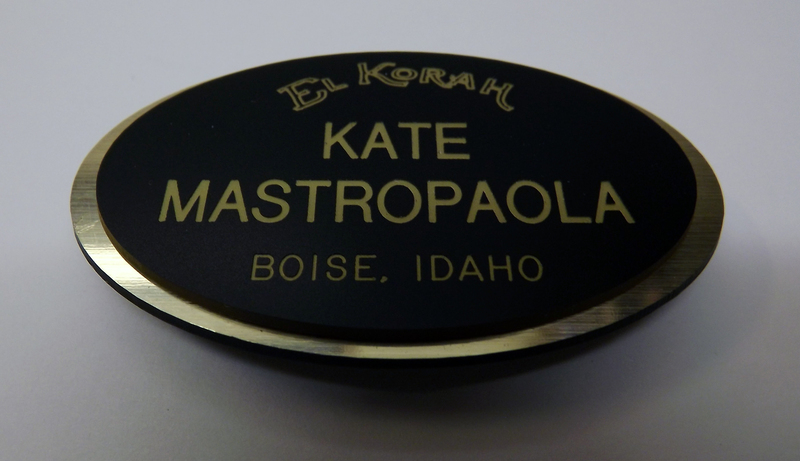 Your company logo can be imprinted on the name badge in any of the foil colors shown on our website (insert link to foil colors). The logo to be imprinted should be submitted in either a vector file format, or a black and white bitmap if using as high a resolution as possible. Some logos can also be engraved on the plastic stock rather than foil imprinted. If you wish to order name badges, please print and fill out the Name Badge Order Form and mail or email to us. Click here for Name Badge Pricing and Name Badge Order Form.